The sea pen was named after the quill pen which it looks like. 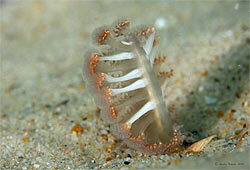 The sea pen is not actually one animal, but rather consists of many separate animals called polyps living in a colony. 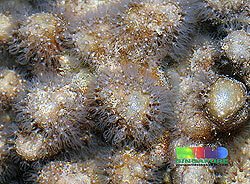 The polyps look look like miniature sea anemones each with eight tentacles. 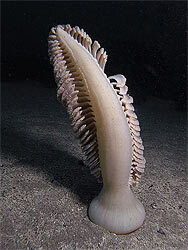 There are around 300 species of Sea Pens or Sea Pansies. They live at many depths from shallow waters down to deep seas in tropical and temperate waters worldwide. They prefer deeper waters where turbulence is less likely to uproot them. Sea pens can have a chunky, more club-like appearance or have a feather-like appearance. 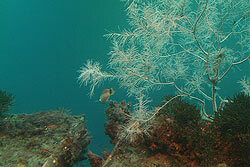 Sea Pens share many features with Soft Corals. The biggest difference is in their habitat. While Soft Corals will attach to hard substrates, the Sea Pens anchor themselves with their bulb-like shape into deep soft bottoms like sand or mud. They can also easily free themselves and move around. They position themselves favourably in the path of currents meaning a steady flow of plankton, their main food. 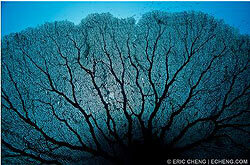 Their major predators are nudibranchs and sea stars, some of which feed exclusively on sea pens. During the daylight hours Sea Pens usually bury themselves into the sand, and come out at night to capture plankton. Each colony is either male or female, though more are females. Colours range from dark orange to yellow and white and are often bright. Many will bioluminesce in the dark. The exposed portion of sea pens may grow up to 2 metres in some species.